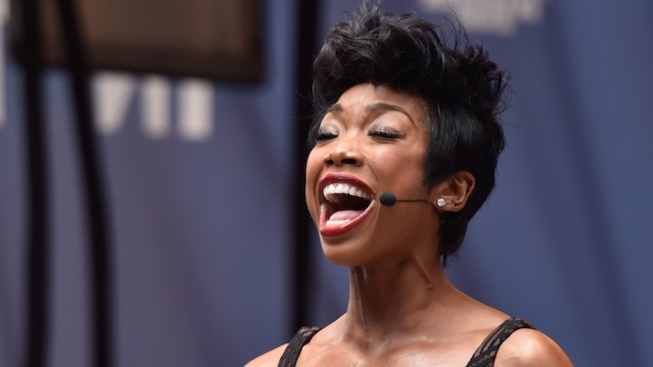 Brandy Norwood Extends Run in "Chicago"
Brandy Norwood as Roxie Hart, during a performance with the "Chicago" company at Broadway's Stars In the Alley outdoor concert on May 27. The name on everybody's lips? Brandy! The Grammy-winning singer, who originally signed on for an eight-week limited engagement in “Chicago” from April 28 through June 21, will now remain with the production through Aug. 2 at the Ambassador Theatre. Norwood won’t be in the show, however, for performances on June 22-23 and June 27-28, due to a scheduling conflict. For tickets and showtimes to see Brandy in “Chicago,” visit ChicagoTheMusical.com.